The comparisons to Terrence Malick are obvious and many—and a well-deserved compliment—for David Lowery's drama "Ain't Them Bodies Saints." The setting of 1970s Texas, the impressionistic wisps of memory, the quiet naturalism of warm sunlight and the dusky magic-hour melancholy—they're all there, all those signatures that are reminiscent of the master filmmaker. And yet, watching Lowery's film also reminded me of another homage in a very different genre: "Far From Heaven," Todd Haynes' 2002 tribute to the vibrant hues and melodrama of Douglas Sirk's so-called "women's pictures" of the 1950s. Each film recreates established aesthetic touchstones while also functioning as its own powerfully emotional work of art. They know how to play all the familiar notes, but they also create their own original and moving symphonies. Lowery's film is a muted but always engrossing tale of young, doomed love. A frequent editor himself—he cut the mesmerizing, mysterious "Upstream Color"—Lowery knows how to create a romantic fluidity while also finding tension in the individual, intimate moments. Seemingly innocuous conversations are fraught with meaning; a glance speaks volumes. And in Casey Affleck and Rooney Mara, he's found actors who effortlessly inhabit his world, one that feels both old-fashioned and immediate. Affleck's Bob Muldoon is more of a small-time crook than a major criminal mastermind. He's a dreamer but a dangerous one because he believes his own hype and will do whatever he must to make it real. But Bob's also a romantic at heart, with notions of building a little house somewhere far away and raising a family—all things that probably would have been impossible even before he found himself in trouble with the law. With her steely eyes and strong cheekbones, Mara is coolly beguiling as his wife, Ruth, who's threatening to leave him at the film's start. She's also pregnant, which is probably the only thing that keeps her out of prison when Bob and Ruth end up in a shootout with sheriff's deputies at their rundown shack in small-town Meridian, Texas. Tiny but fierce, Mara makes her character's inner conflict and remorse evident in small, subtle ways. The moment in which they're being led off in handcuffs, side by side, is achingly sad and sensual. They hold hands as if for the last time, which it very well may be. Each whispers something to the other—breathes in the other's essence—before they're finally torn apart. While Bob goes off to prison on a 25-year sentence, Ruth raises the couple's daughter, Sylvie (played by twins Jacklynn and Kennadie Smith), who's about to turn 4 when we see them again. They live next door to Skerritt (an excellent Keith Carradine, himself a welcome throwback to the kinds of '70s films that clearly inspired "Ain't Them Bodies Saints"), who runs the town hardware store and possibly the town itself. One of the beauties of Lowery's script is its spare approach to storytelling. Beyond its restrained tone, it also withholds some basic details, challenges us a bit to fill in the blanks, which results in discoveries that are both lovely and startling until the very end. The character of Skerritt is a great example—it's hard to pin down exactly who he is, what misdeeds he's done or even what his relationship is to Bob and Ruth is. We know he looks after this woman and her little girl, but his intentions can be interpreted in a variety of ways, especially once Bob breaks out of prison and heads back to Meridian to fetch his family. Meanwhile, sheriff's deputy Patrick Wheeler (a beefy and uncharacteristically subdued Ben Foster), who was hit in the shoulder during that fateful shootout, also has entered Ruth and Sylvie's life. His motivations also are intriguingly unclear: Does he just want his man, or does he genuinely want to function as a husband and father figure? As Bob inches ever closer, putting pencil to parchment to signal his approach in poignant love letters to Ruth, a trio of bounty hunters also is headed their way. This sounds far more eventful than it is; to continue the Malick comparison, "Ain't Them Bodies Saints" has more of a propulsive narrative drive than most of his work, but it's mainly preoccupied with the spaces in between the action. Lowery takes his time and lets us linger over everything in the meticulously crafted frame: the thoughtful camerawork, the impeccable costume and production design. His film is at once gorgeous and gritty; it earned an award at the Sundance Film Festival for the robust and dreamlike visuals from up-and-coming cinematographer Bradford Young, who also shot the recent indie favorites "Pariah" and "Middle of Nowhere." And the highly inventive score from Daniel Hart, a mixture of strings and claps, enhances the rapturous experience. Now about that title…it's admittedly terrible. Clunky, potentially off-putting. Don't let that throw you. 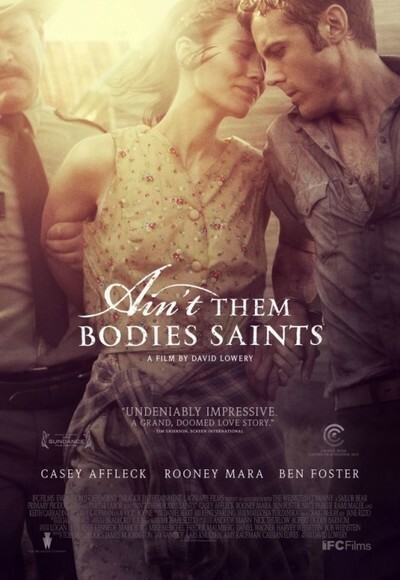 "Ain't Them Bodies Saints" is a film that will reward you for seeking it out.